Despite our pleas, the weather still hasn’t come through yet, but I’m holding out for a gloriously sunny Jubilee Bank Holiday weekend to make up for it. If you’re still looking for Jubilee party ideas, we’ve got some great outdoor toys and games for the kids, and tips on how to have a safe street party, as well as some delicious food ideas. We’re celebrating all things British with this month’s Inspired, from home ware to food to fashion, and we’ve also been searching out some great vintage-style fashion ideas that hark back to the 20s, 30s and 40s. We loved the Rigby and Peller feature, too. It was lovely to see a photo shoot using ‘real’ women rather than airbrushed models and we’re really glad you like it! In this issue we also have a real treat – an interview with the lovely Keris Stainton, a talented author who is launching her third book this month. We’ve also covered holistic health, come up with some fun Father’s Day gadget gift ideas, taken a look at some funky outdoor furniture ideas (for when it does actually stop raining) and much more. We hope you enjoy reading this month’s Inspired and have a wonderful June! 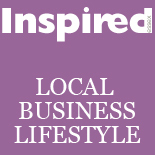 This entry was posted on June 9, 2012 by inspiredessex in Magazine and tagged Chelmsford Magazine, Essex Magazine.